Ibiza holidays...where do we start? 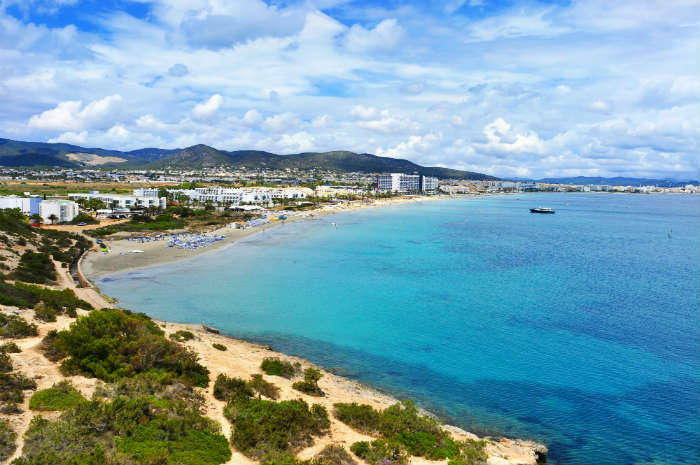 The beautiful White Isle that hosts some of the biggest parties in the world is also home to some of Europe’s most stunning beaches. You’ll find the quiet beaches which are perfect for taking some time out. You’ll find the party beaches where you can start the night early and roll straight into clubs, or you can move straight from the club onto the beach the next day. 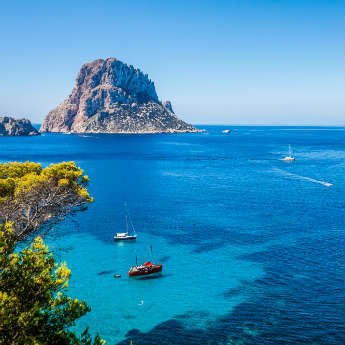 Without a doubt though you’ll see some of this island’s most scenic beauty on the coast and here’s the Ibiza Beach Guide to help you make the most of your holiday in Ibiza! A long and chilled out beach, Playa d’en Bossa is one of the most popular beaches in Ibiza thanks to its ideal location next to some of the best clubs on the island. With Hard Rock Hotel Ibiza and Ushuaia Ibiza right on the beach front you can easily switch from lounging by the swimming pool to relaxing on the beach before heading to the clubs in the evening. This is the perfect beach if you want a mixture of daytime relaxation and night time partying. How do I get to Playa d’en Bossa? 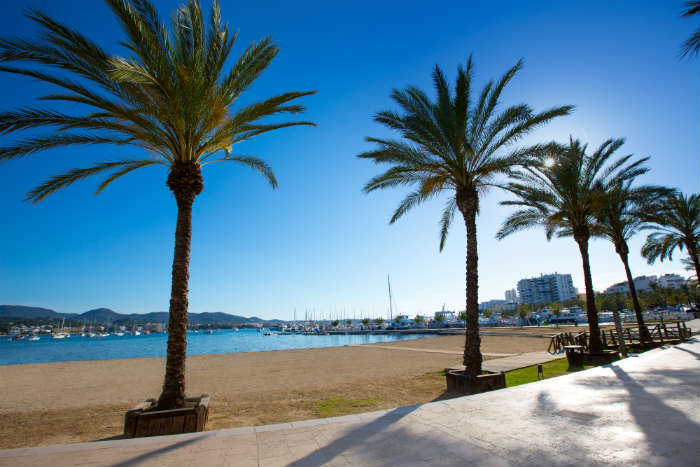 If you want to go to Playa d’en Bossa you can easily catch a bus from Ibiza town or alternatively you can rent a car and drive 4km to the popular beach and park in one of the car parks around the resort. Based in Ibiza’s biggest resort of San Antonio, S’Arenal de San Antonio is backed by a wonderful promenade where visitors can walk the length of the 500 metre beach. The beach is also backed by some of the world’s most famous clubs so don’t expect a quiet night here unless you’re coming out of season. 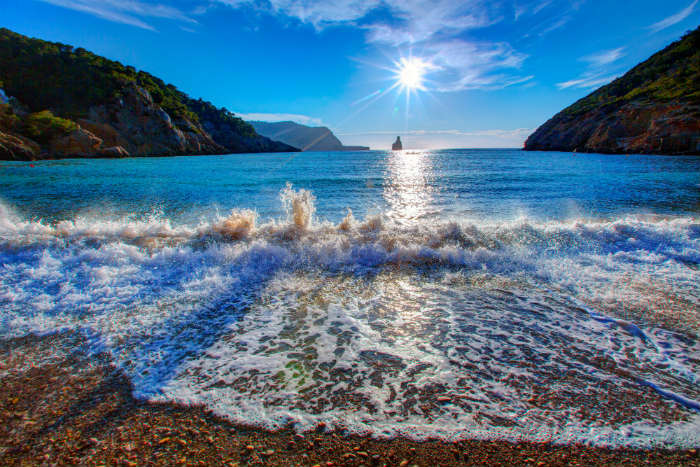 This beach is also an ideal spot to book on dolphin sightseeing tours, Ibiza boat parties or scuba diving if you fancy a bit of underwater adventure. How do I get to S’Arenal de San Antonio? As it’s directly in the middle of San Antonio, it’s easy walking distance if you’re staying in the resort. However you can also catch a bus from Ibiza Town which takes around 40 minutes and runs regularly through the day. Better known as the Sunset Strip, this part of Ibiza, which is just around the corner from S’Arenal de San Antonio, is the place to be for evening cocktails and easy on the ears music. 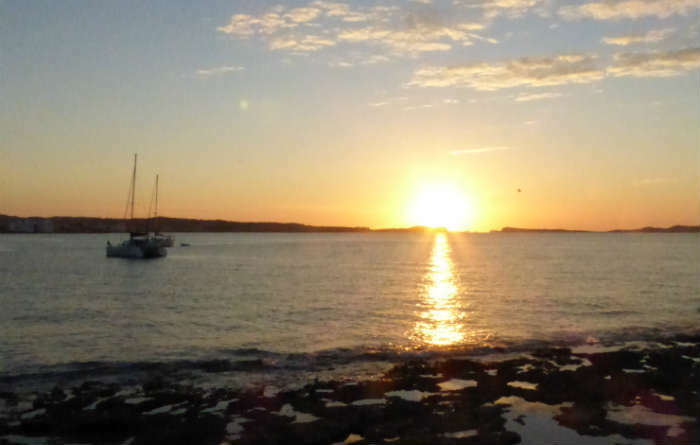 ; Although it does get lively in the evening at Café Mambo and Café del Mar, during the day guests can take a dip in the ocean, enjoy the sun on the smooth flat rocks and settle down for what is one of the world’s most spectacular sun sets. 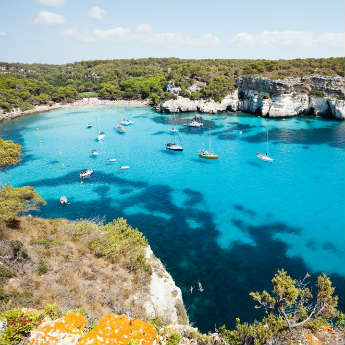 How do I get to Calo des Moro? If you follow the promenade from S’Arenal de San Antonio to the right you’ll come across the bare rocks which will take you out to the Sunset Strip. It takes about ten minutes to walk so it’s easily accessible for a day in the quieter part of San Antonio. This family orientated resort on the east side of the island is peaceful, relaxing and attractive with fountains flowing through the town centre and a beach that’s fringed with palm trees. The beach its self is well suited to families with its shallow, clean waters and there are plenty of pedaloes available to hire for those that want to get out on the ocean with the family. How do I get to Platja de Santa Eulalia? 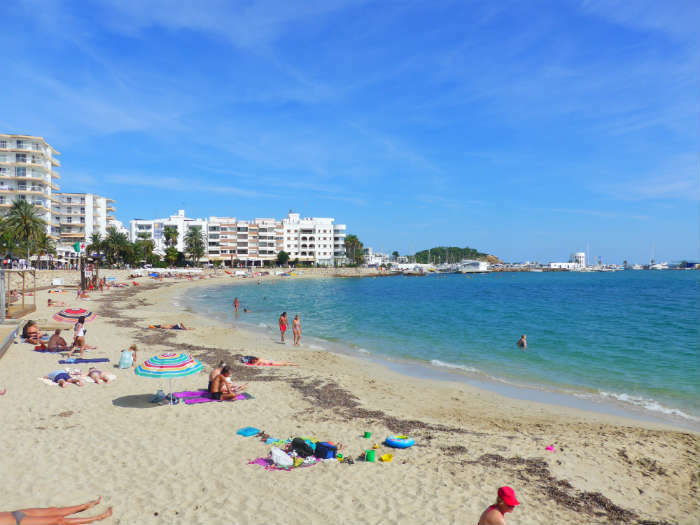 If you’re not based in the resort of Santa Eulalia for your holiday in Ibiza, the you can easily catch a bus from Ibiza Town, San Jose or Es Cana. You can also drive here but a more unique mode of transport would be the ferry from Ibiza Town where you can catch amazing views of Ibiza’s coastline. Backed by pine woods and with the picture perfect white beaches and clear blue water, there’s no wonder Las Salinas is a popular place to soak up the Ibizian sun. As this beach is 10 minutes away from Playa d’en Bossa and Ibiza Town, it is convenient and easily accessible for those staying in the surrounding resorts and is a great place to pick up tickets for that all important club ticket. Of course, Las Salinas is quieter off season but the atmosphere during the summer months is hard to beat with the young crowds in Ibiza. How do I get to Las Salinas? 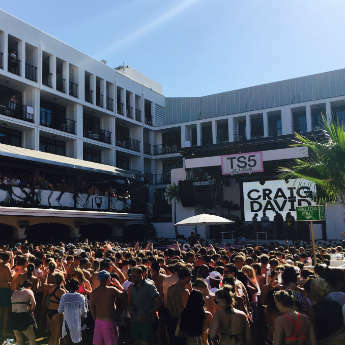 You can drive the 10 minutes from Playa d’en Bossa or Ibiza Town and take advantage of parking on the main road, if it’s available or pay to park near the main roundabout where you can keep your car secure and in the shade. Towards the north of Ibiza near Portinax, the islands beaches get a little quieter, more secluded and altogether more scenic. Cala Xuclar is one of the best places to really get away from it all and although there is a steep slope down to the beach, it’s well worth the walk as guests are rewarded with a quiet little cove, clear water that’s perfect for swimming and rustic fisherman’s huts surrounding the edge of the beach. How do I get to Cala Xuclar? Cala Xuclar is only a 5 minute drive from San Juan or Portinax so it’s easy to get to if you’re wanting a quiet day on the beach. Parking is limited though so get there early or walk to the beach to grab your spot for the day. Have you been to Ibiza? Which beach is your favourite? If you’re interested in going on holiday here then why not check out 4 Places You Won't Believe Are In Ibiza.